Shopping for Pirates of the Caribbean Action Figures? What! No rum? The rum's all gone but Jack's still here for the taking. 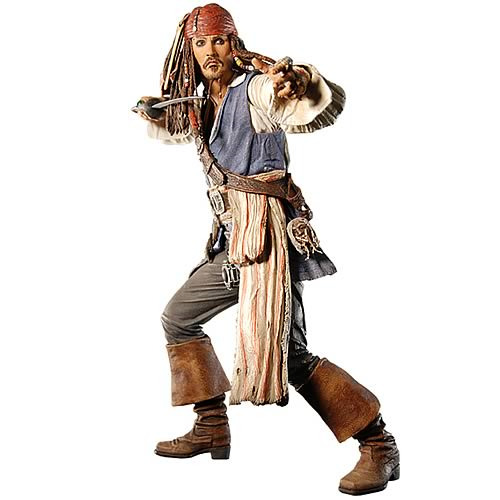 Based on Jack Sparrow's appearance in Pirates of the Caribbean: At World's End, this exceedingly realistic 18-inch tall action figure captures his essence and is sure to please Johnny Depp fans of all ages. Jack comes with movie-accurate accessories and multiple points of articulation. Highly detailed and hand painted, this massive recreation also speaks several phrases from the film, including "Davy Jones fell prey to the greatest of beasties mate, love." Now, that's Jack Sparrow! Other phrases include: "I've always valued the Pearl for two reasons. The first is freedom and the second, well, the second's much like the first." "Me compass don't point to what your heart desires, it points to what your heart most desires."